Your smile would undoubtedly be one of the most important features that people notice first. Hence, it would make complete sense that you would like to do something about your smile in order to make yourself look and feel good. Porcelain veneers are a very good option if you would like to boost your confidence. That is why if you are thinking about going for porcelain veneers, you should get to know more about it. Veneers are thin shells of ceramic that would be attached to the front surfaces of your teeth. The best part is that each veneer would be designed according to your specific requirements. It would be because of this reason that it would be considered to be a cosmetic dental enhancement. In addition, you can smile because veneers are made from advanced materials that would help to mimic the appearance the natural enamel of your teeth. Unlike the composite veneers which would require more maintenance as they are more likely to chip, you would find porcelain veneers to be more durable. This is because they would last somewhere between 12 to 25 years and would rarely require any maintenance. 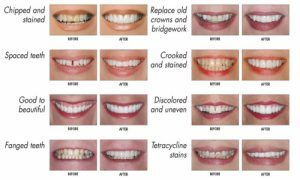 If you have serious malformation, discoloration, or misalignment of the teeth, then you would find porcelain veneers to be a much better option for your unique circumstance. If you feel that your teeth are misaligned and small, then you would find porcelain veneers to be quite ideal. This is because they would be made from a mold of your teeth and would thus fit inside your mouth quite proportionately. In the case of porcelain veneers, the gum tissue would tolerate the porcelain better over composite veneers. Therefore, if you would be able to take care of porcelain veneers properly, then it would be a great option for your overall health. They would be the best choice for mimicking the natural feel and look of your teeth and would almost always make it unnoticeable. In addition, since they also tend to last practically forever, you would never have to worry about them becoming chipped or rotten over time. Aside from the general oral hygienic maintenance, there would be nothing special that you would need to be worried about. Lastly, if you are thinking about getting porcelain veneers from Dr. Powell, then you would first have to make sure that you have overall good oral health. In addition, you should also be committed to maintaining proper hygiene, oral care and regular dental checkups. This is because if you would be making this kind of an investment for your smile, you would like to make sure that it would indeed pay off in the long run. Therefore, if you would like to know more about porcelain veneers and the process that entails, feel free to contact Dr. Powell. We look forward to hearing from you.